Speed Clean Canvas and Sail Cleaner is specially formulated to lift dirt, grease and stains from both natural and synthetic fabrics, including sails, boat covers, tents and awnings. - Concentrated formula: removes dirt, grease and mildew stains. - Great for boat covers, bimini tops and sails. - Does not weaken fabric or thread. - Also cleans nylon and dacron sails. 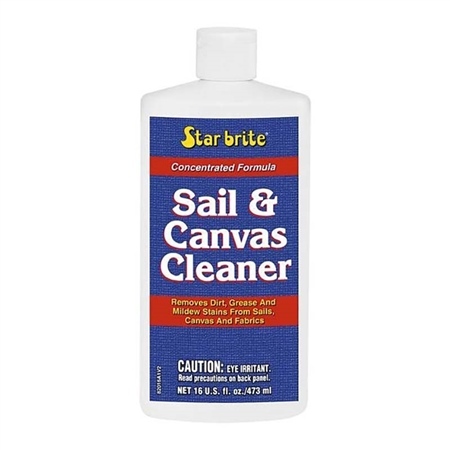 Dilute one part Star brite® Sail & Canvas Cleaner in four parts water. (For heavily soiled white materials use full strength.) Wet down surface to be treated. Apply with sponge or brush to a small section using scrubbing action. Wipe or rinse off cleaned area before solution dries. Continue applying in same manner until entire surface is cleaned. NOTE: Before using, test an inconspicuous area to be sure there is no adverse reaction. After sail, canvas or fabric is cleaned, apply Star brite® Waterproofing to make material water tight and resistant to future soiling. Used it and it was surprisingly good. Had to scrub harder in places but did what it said it would.